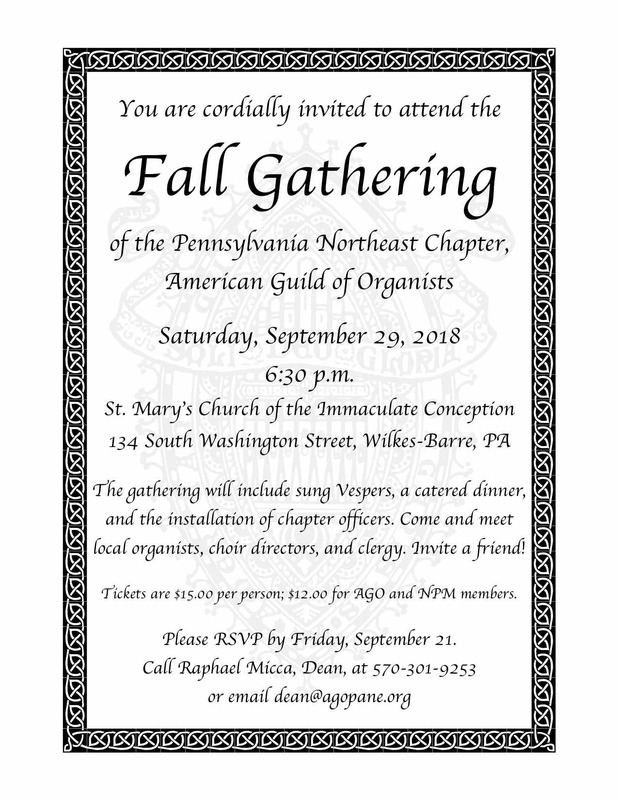 You are cordially invited to attend our chapter’s Fall Gathering at St. Mary’s Church of the Immaculate Conception, 134 South Washington Street, Wilkes-Barre, on Saturday, September 29 at 6:30 p.m. The program will begin with Vespers followed by a buffet-style dinner and the installation of officers. The program is open to the public: please spread the word and invite your pastor, colleagues, and any other interested persons. Tickets are $12 for AGO and NPM members and $15 for non-members. Payment will be accepted at the door, but reservations are required. Please R.S.V.P. by Friday, September 21 by calling 570-301-9253 or email dean@agopane.org. < Previous Pedals, Pipes, and Pizza is coming to Scranton! Pedals, Pipes, and Pizza is coming to Scranton!